Weekend Update: HipHipHoorayRae (& the Bay) | Priya the Blog | life & style in Nashville & beyond! It’s funny that I just wrote about experiencing California blackout mode, since this weekend was a bit atypical. I got home on Thursday evening to an empty house, my parents were in Finland ‘til Sunday night, and I even had time to like, exercise and nap and think. Which I’m not mad about! Rachel and Ray’s wedding festivities kicked off with a ranch rehearsal bash in Livermore that everyone was invited to, which is such a cool idea! I absolutely adore Rachel’s family (Grampy included, or maybe even most of all) and I hardly get to see them anymore, so that was a blast. 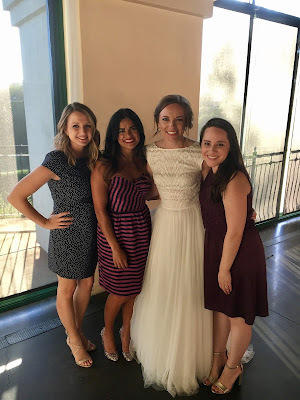 Also I live for the chances to see my “auxiliary” friends from high school, that only occur during wedding festivities (<3 Monica Hannah Bekah Leighah Claire!) I also live to sit in between Katie and Jacqui for a while and just be a sister wife for an evening. On Sunday I finally got to see Galina’s new place and hang with her and have baby’s first acai bowl, I stopped by and saw Jenae and Dingo Dan’s awesome new house, and then basically had a glam squad as Galina did my hair for the wedding- which I can get used to! The wedding was in San Ramon and it was HAWT and so beautiful. Rachel and Ray seemed so joyous the whole time. If their marriage is anything like their wedding was, it’s gonna be a FUN life. Also- Rachel is actually everyone’s favorite friend because I swear there were 30 girlfriends there (apart from bridesmaids) from throughout her whole life. Congrats Rachel & Ray! Thanks for letting me celebrate with you! See you on the farm in Colorado! And I’m back in Nashville, for now anyway!